After spending schoolboy years at Luton Town FC and Cambridge United FC. Paul matured quickly into senior football making his debut aged just sixteen years old for Buckingham Town in the early 1980s. His first season culminating in reaching the last 16 of the FA vase competition. After a couple of seasons Paul gained a highly regarded reputation as one of the best goalkeeper’s playing at semi professional level playing for many clubs ranging from Kettering town, Rushden and Diamonds and Baldock town. Paul took a break to develop outside business interests in the late 1990s but he now wants to embark on a goalkeeper training career and feels he has a lot to offer all aspiring goalkeepers with his wealth of knowledge of the game that he has, which he wants to share. Paul is FA Level 2 qualified and a member of the FA Licenced Coaches Club CRB checked and has the relevant safety certificates. At the end of 2015 Paul has over 100 keepers training with him, over 4 evenings each week. He also has plenty of successes within his group of keepers. He has keepers training with the likes of Chelsea, Norwich, Leicester & Stevenage Academy’s to name but a few. Paul has worked hard during 2016 and keeper levels have risen but best of all some keepers have been asked to train with clubs academies , so the future looks bright. Well I don’t usually make New Year Resolutions but this year I want to try and encourage more new keepers to take up the position and then help them to be the best they can. Anyway HAPPY NEW YEAR TO YOU ALL !!!!!!!! Firstly I would like to wish everyone a Merry Christmas and hope Santa brings you lots of what you want. Sir Herbert Leon Academy in Bletchley, Harpenden, Brackley Town FC, Winslow & Flitwick. Another Session will starting up in Central Milton Keynes next to railway station. We are averaging over 150 keepers per week. I was looking back at our keepers who have been given the opportunity to train and learn under an established Academy. It fills me with great pride that these young boys and girls started their goalkeeping life with me and through there dedication and hard work have gone to there next stage of learning how to be a goalkeeper. I look forward to seeing the next chapter of there goalkeeper lives unfold and hope that I can make this happen to many more boys and girls in my future as a goalkeeper coach. In short if your son or daughter wants to become a goalkeeper whether it be grass roots or premier league then J4K Bucks and Herts are the one to go to! Good Luck to all Goalkeepers everywhere may all your dreams be turned into a reality. AYLESBURY, BANBURY, BUCKINGHAM, ST ALBANS , HIGH WYCOMBE, NEWPORT PAGNELL, WHEATHAMPSTEAD. Its been a busy couple of months as we held our Goalie Wars & Easter Camps which by all the comments we had back was a great success, thank you everyone for coming and making it special. We have over 120 keepers with j4k Bucks and Herts being coached each week and the quality of keepers just keep on getting better and better. We have started a camp in Banbury and I expect it to go from strength to strength in time. Go to our web page for photos and winners www.j4kbucksandherts.com and a link to our Facebook page where we would like you to like our page. Paul and some of our keepers were at the Elite football competion held at the MK DONS STADIUM on Sunday 7th May. We had keepers there representing there Clubs and others were helping by being Ball Boys with me and all had an enjoyable day, the organisers have promised a follow up next year. Moving forward I have the new dates for HALF TERM CAMPS at the end of May and beginning of June. May 30th– Tuesday, Aylesbury FC, Haywood Way. A Camp that has always been well supported so book early! May31st – Wednesday, Wheathampstead Astro Centre. Another Camp that has grown bringing keepers from Cheshunt, Welwyn Garden City, Luton & Ware to name but a few. Book before its to late! June 1st – Thursday, Newport Pagnell FC, Willen Road. North Milton Keynes has a wealth of Clubs in the surrounding area and so quality is never at a short fall if you come to this camp. So go on line to book early! June 2nd – Friday, Banbury, Easington Sports FC. This venue has only started a short while ago but with interest from the Oxford area and beyond, I’m sure this venue will grow and grow. Things to remember we coach ALL YEAR ROUND!! Our Head Coach is a Proven Professional who is just putting up his playing boots now at the tender age of 50 yrs old. He lives for his goalkeepers and wants each one of them to succeed in what that wish to achieve. He believes in having Fun whilst learning and as a true Professional he has dedicated his whole life to ensure all his keepers learn in a safe and enjoyable manner. Go to www.j4kbucksandherts.com for more information and to book online. I would like to thank all the keepers and their mums & dads who came to half term camps in February, the response has been very positive. Photo’s are on my Facebook page for everyone to see. Well at last March is here and the grass surfaces are nearly ready to train on (sorry mums muddy kits to be cleaned). The clocks go forwards towards the end of the month so the lighter nights will soon be upon us. I have some Big Plans for 2017! On Wednesday April 5th I am holding a “GOALIE WARS” at Aylesbury FC, this is where Keepers can come from all over and face off against other keepers, the last Goalkeeper standing being the WINNER. Prizes for all age groups more details to follow. We would like to give a huge well done to a keeper from Wheathampstead who has been asked to train with High Wycombe for the second year running. These are just some of the exciting items starting at J4K Bucks & Herts during this year. Paul would like to congratulate Charlie Bolland from our Buckingham school who has been asked to sign Professional papers with WEST HAM UNITED on her 17th birthday. This is even a greater feat for when she started out with Paul at the age of 13Yrs old she had never been in goal before. What a story, we wish her all the best in the world. We have also had a few more being sought by other clubs including Wycombe wanderers, Stevenage and MK Dons. Well done to all our keepers with hard work and dedication who knows what can be achieved. Paul has just arrived back from coaching in Japan during the Christmas shut down and I am ready to bring a touch of the sun to Bucks and Herts if not the Language. Hello Fellow Keepers its that time again Half Term Camps are starting again!That’s right February is nearly upon us. J4K Bucks and Herts are running Camps on Tuesday 14th February at Aquavale Aylesbury, Wednesday 15th February at Wheathampstead Astro and on Thursday 16th February at Newport Pagnell FC. Cost £35 per keeper, 10am to 3pm on a first come first served basis so hurry places going fast. These Camps are for beginners to advanced keepers, Paul and his team work hard to cater for all there keepers needs but with fun and enjoyment at the forefront of every thing they teach. Paul’s style of coaching has made him the must go to Goalkeeper coach in Bucks and Herts, this is shown with a lot of his weekly venues nearing capacity. So start 2017 with a clean sheet learning from a local lad who wants to give back to grass roots football. HAPPY NEW YEAR TO ALL MY FRIENDS, COLLEAGUES AND YOUNG KEEPERS, MAY ALL YOUR WISHES COME TRUE IN 2017!!!!!! December – Word gets around Paul has been asked to go to .….JAPAN !!!! to coach young keepers in the sport he loves. He will travel out on 21st December and return 7th January 2017. GLOVE SALE now on at J4kbuckansherts.com 20% off when you use Promo code J4KPW20 valid until 16th December. November – Paul volunteered for the Youth Enterprise Scheme which allows Paul to go into schools and discuss with 6th Form pupils their career path into Professional Goalkeeping. Paul has also been coaching at an Elite programme for 16yrs to 21yrs old at the Football CV Academy in Stamford. Keepers from all over the world go there to improve there skills. If you’d like any more information about any of our summer camps, please don’t hesitate to get in touch with Paul via 07850 803690 or email at paulwarnecki@outlook.com! Great News- J4K is coming near you soon. Book online at www.j4kbucksandherts.com or call Paul on 07850 803690 email paulwarnecki@outlook.com. Tuesday 3oth August at Haddenham FC near Aylesbury in Buckinghamshire. Thanks Paul & Co, Bailey had a great day. BOOK your Free Session and have fun whilst learning with the art of Goalkeeping with Paul Warnecki. What a great turnout for the Summer dates that have passed, I would like to thank everyone who attended, we even had a keeper from Austria attend. And I thought nobody knew who I was!!! Contact Paul for a booking form now!! NEW VENUE FOR A NEW CAMP THIS SUMMER! ONLY £35.00 PER STUDENT PER DAY OR £55.00 FOR BOTH DAYS! GAWCOTT, BUCKINGHAM – MONDAY 25TH JULY. HADDENHAM, AYLESBURY – TUESDAY 26TH JULY & TUESDAY 30TH AUGUST. WHEATHAMPSTEAD ASTRO – WEDNESDAY 27TH JULY, WEDNESDAY 10TH AUGUST & WEDNESDAY 31ST AUGUST. NEWPORT PAGNELL, MK – THURSDAY 28TH JULY & THURSDAY 1ST SEPTEMBER. COLNEY HEATH – FRIDAY 29TH JULY & FRIDAY 2ND SEPTEMBER. DATES FOR HIGH WYCOMBE, HEMEL HEMPSTEAD & BANBURY COMING SOON! SUMMER VENUES WILL BE CONFIRMED VERY SHORTLY SO WATCH THIS SPACE!! CHECK OUT THE NEW VENUE FOR MY MONDAY NIGHT SESSION IN BUCKINGHAM. The Richard Roper Playing Fields, Lenborough Rd in Gawcott. MK18 4JG. WHAT A BRILLIANT 6 MONTHS IN 2016 IT HAS BEEN!!!!!!!!!!WOW!!! I hope some photo’s will be attached soon. 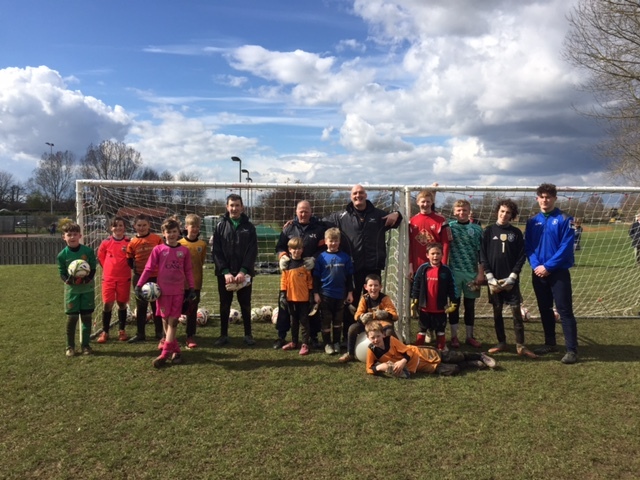 A Fantastic time was had by all at the Easter Camps with over 70 keepers learning their Trade. I would like to thank all those that came and if you couldn’t turn up, I hope to see you next time. TO ALL MY JUST4KEEPERS FRIENDS I HOPE THE WEATHER KEEPS DRY WHILST ALL OUR CAMPS ARE ON. MAY YOU HAVE FUN,AND LEARN YOUR TRADE. CONTACT PAUL WARNECKI ON 07850 803690 to book your place now!!!! My February coaching camps were a huge success with 87 students coming to 4 venues in 4 days. WOW!!!!!!! The fun really has started. Thank you to all those keepers who attended, and thank you to all the mums & dads for getting them to the venues. Friday 15th April Harvesters FC, St Albans. HALF TERM CAMP DATES NOW IN!!! AYLESBURY 16/2/16, WHEATHAMPSTEAD 17/2/16, NEWPORT PAGNELL 18/2/16 & HARVESTERS 19/2/16. ALL START AT 10AM-3PM CONTACT PAUL EARLY FOR A PLACE ONLY £35.00 per student. Paul can also train keepers on a one to one basis at a time convenient to you. New to 2016 Birthday Party options available. WE WILL COVER BALL HANDLING, POSITIONING,CATCHING, SHOT STOPPING AND MUCH MORE. Half Term Camps Start 24th October BOOK NOW!!! Goalkeeper Training Camps start this week!! 2 Weeks to go!! Training Camps starting at a venue near you!